That's Thai for 'very delicious'. During the month of August I cooked one of my most favourite Thai dishes from scratch. In Australia, Tom Kha Gai can be found in the entree/soup section of your Thai Restaurant menu. I have eaten this chicken galangal soup all over Thailand, and the one that I cook is very muk mar authentic. This recipe is from a cooking course I took in Koh Lanta. The Lanta Thai Cookery School was part owned by a Sweedish man, but the course was run by a young Thai man, with the assistance of an older lady - who fell in love with Adam and kept feeding him Chang and by the end of the course, he was sufficiently drunk. I slung my camera over my shoulder and managed to get a bunch of photo's for you. The recipe is for one serve. I just adjust it depending on how many I am cooking for. You don't have to be super strict with the quantities, just as long as there is a sufficient amount of each to give the soup a good flavour. I have (and love) my rice cooker, so I will always put it on before preparing and cooking so that I know it is ready to go when I am ready to eat. It's so simple and the rice is perfect every time. I always wash my rice. Fill it up with water, swish around with your hand. Empty the water (without losing the rice down the sink) and repeat until the water is much clearer. I then went and harvested some of my ingredients from my garden! That's lemongrass, galangal and kaffir lime. Hell's yeah, I've been keeping these plants alive long enough to eat them! 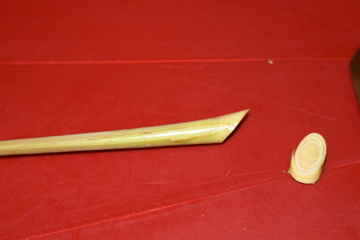 Galangal is a Thai ginger. You can usually find it in Coles and Woolies next to the ginger. Or of course, your local asian grocer. It is usually more pinky/purple in colour. I bought mine from Bunnings it was labelled as Thai Ginger, but it looks more like regular ginger. Galangal freezes well in a zip lock bag, but you will need to give it plenty of time to defrost, cuz it is almost like wood and near impossible to cut when frozen. Mine is fresh from the garden and hence super easy to slice. A few of the ingredients in this dish are simply for flavouring the soup, and shouldn't be eaten. Well technically you can eat them but it is bloody unpleasant! Galangal is one of the ingredients that shouldn't be munched on... So is the kaffir lime leaves. Rip these up like so. Lemongrass is the final ingredient that I recommend not eating. It's all about putting that flavour into the soup. And yes, this is the big tree like plant a few pictures earlier. You can find this in most supermarkets in the herb section, with a lot less height and no leaves compared to my 'just-cut-from-the-garden' version. 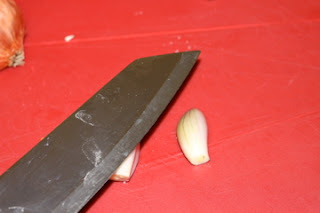 Cut your Lemongrass on a diagonal to get maximum flavour. 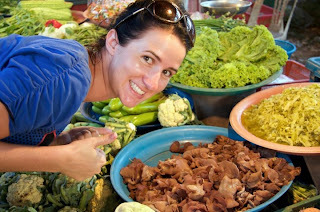 When making this dish in Thailand, we used what they called Elephant Ear or Jelly Mushrooms. I am still have not found these in Australia, but I do know that Mum found them in Coles or Woolies once, so I still hold out hope for the future! They actually look like elephant ears (hence the name), so yes... they look hideous but they are delicious. You can see how much I love them in this photo taken by Tim on our last Thailand trip. We LOVE to look through the local markets. So until I can get the real thing, a good substitute for these awesome mushrooms is straw mushrooms which are found in the asian food section usually near-ish to the coconut cream. There is a couple of brands and either are good. The tin comes filled with some sort of water juice which I drain and then cut the little mushrooms in half. Yes, they look a little phallic (I think thats how you spell it). But they are yummy in the soup. 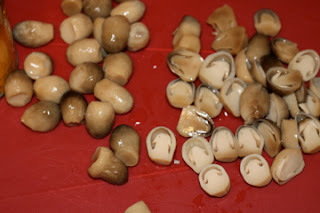 You can also use regular western style mushrooms if you wish, I personally would go for other styles of asian mushrooms instead. I tried Enoki mushrooms once and I think they were good. I will have to try it again and get back to you on that. 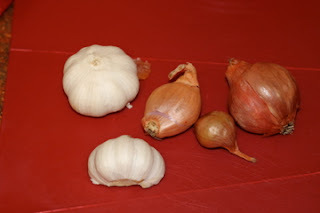 Asian golden shallots can be found in the onion section of your supermarket. These and the garlic cloves are smashed to get the flavour out. 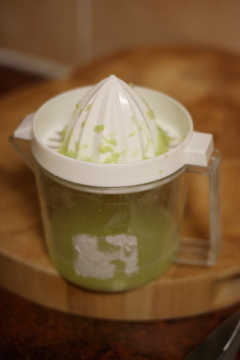 My juicer is ugly, but it works well. Now you're right to go! 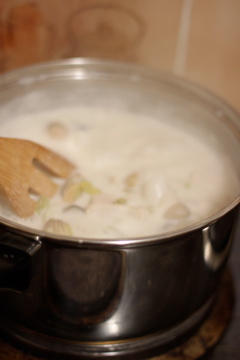 Grab a saucepan and bring your coconut milk/cream to the boil. Either is fine, if you use cream and you find it a little thick (it really depends on the brand) you can always add a little water to make it thinner. Once its at the boil, throw in all your vegetable matter. Thats your galangal, kaffir lime, mushroom, lemongrass, garlic, and golden shallots. Stir and smell the deliciousness. Give it a few minutes, then add chicken. Add sugar and salt. Add fish sauce. This is like the Thai salt. It brings out a lot of the flavour in most Thai foods. I love it. If you are cooking for more than 2 people I recommend adding 2 tablespoons of fish sauce and then tasting your soup before adding more. You don't want it getting too fishy. Just think of it like salt - and add it to taste. When the chicken is cooked through, take your soup off the boil and add the lime juice. This is is my dinner served. It was difficult to find some table room. Nick was visiting so that he could wage war against Adam. Warhammer, it's like a self-made board game for big boys. Thankfully, I managed to convince them that it was not a good idea to draw on my original 1950's laminate table with white board marker. It could wipe off, but if it doesn't you're dead. 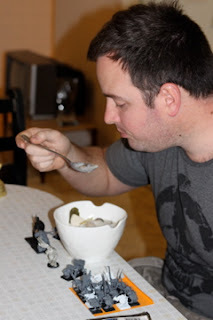 He did manage to pull himself away long enough to eat 2 bowls worth of my soup. Adam was able to squeeze his bowl somewhere between his army of Ratmen. As you can see below, I choose to leave all the inedibles in my soup and just eat around them. It's best that way. This soup is also awesome as left overs, as the flavours are able to continue to develop. I take it for lunch the next day, and constantly get comments on how good it smells. Now you can enjoy it for yourself!